Cook the bacon pieces in a 3-quart saucepan, stirring frequently, until crisp. Remove bacon to some paper towels to drain. Remove all but 2 tablespoons of the bacon fat from the saucepan and add onion, celery, potatoes, salt, and pepper and cook until the onion is softened, stirring occasionally, about 5 to 7 minutes. Stir in the water and bring it to a boil. Reduce the heat and simmer, covered, until the potatoes are just about tender, about 10 minutes. Add the milk and simmer uncovered for an additional 4 to 5 minutes, until the potatoes are tender. 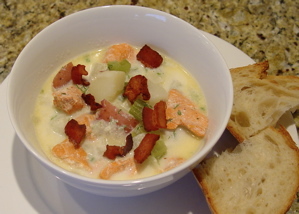 Stir in the salmon pieces, dill, and butter and simmer until the salmon is just cooked through, about 3 to 4 minutes. Serve sprinkled with the bacon pieces. 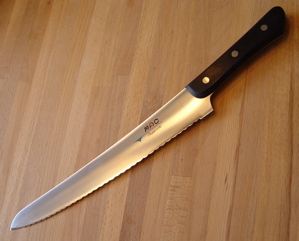 I occasionally get in the mood to chop up vegetables. The best way I’ve found to quell the urge is to whip up a batch of vegetable soup, the first step of which is to make some vegetable stock. The following vegetable stock recipe is from 3 Bowls: Vegetarian Recipes from an American Zen Buddhist Monastery, a book I bought when my wife (at the time, my girlfriend) was a vegetarian and I wanted to cook for her. The recipe is versatile; I use it for vegetable soup, french onion soup, and even brining my Thanksgiving turkey. After chopping up the vegetables, place them in a large pot. Add the olive oil and toss the vegetables to coat. 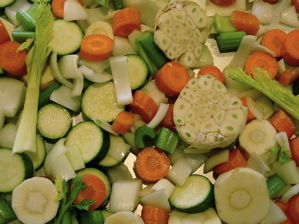 Spread the vegetables out on a large baking sheet and roast them for 10 minutes. Stir and roast for 5 more minutes, but don’t brown them. Put the vegetables back in the pot and add the bay leaves and 12 cups of water. Bring to a boil, reduce the heat, and simmer for 30 minutes. Let the stock stand for 10 minutes and then strain and discard the solids. Use the vegetable stock as directed in your recipe. One of my favorite pieces of cookware in my kitchen is my red Le Crueset cast-iron round oven. It’s heavy as heck, but it sure can make a great pot of stew. This past weekend I made a big batch of chili–I’ll post the recipe soon–and my heavy red pot did its job nicely, evenly heating the chili with a constant low heat. It’s a great size, too, especially for just the two of us. We’ve been eating left-over chili for three days now. If you don’t have one of these things, you should pick one up. They’re not cheap, but it’s something that could stay in your family for generations. Separate the seeds from the pumpkin innards and rinse, if desired. Toss the seeds with 1/2 to 1 tablespoon of vegetable oil per each cup of seeds. 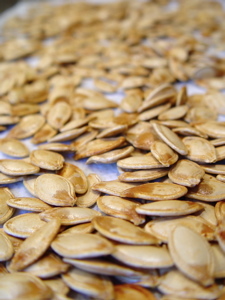 Spread the seeds out over a baking sheet and bake in a 250&deg F oven for about an hour and a half, stirring occasionally. Once the seeds are dried out, you can either allow to cool and eat them or season them further and toast them in the oven at 350°. The combination of this weekend’s temperature drop and the start of the football season means that if fall’s not here yet, it will be soon. Around our kitchen, fall means the reappearance of dishes like stews and casseroles. One of our favorite quick casserole-like dishes is baked macaroni and cheese. 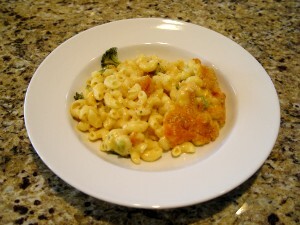 We made that today, based on the recipe we found years ago on the back of a box of Mueller’s elbow macaroni. We’ve tried a number of other recipes, but we always come back to this one. Cook the macaroni for 7 minutes and drain. While the macaroni is cooking, combine the corn starch, salt, mustard, and pepper in a small saucepan. Stir in the milk and add the butter. 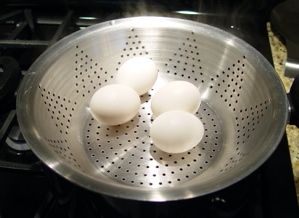 Bring to a boil over medium-high heat and boil for 1 minute. Remove from the heat. Stir in all but a big handful of the cheese and the broccoli. Stir in the macaroni. Spray a 2 quart casserole dish with non-stick cooking spray and pour the macaroni and cheese into the dish. Sprinkle with the remaining cheese and top with the bread crumbs. Bake in the oven for 25 minutes or until lightly browned and bubbly. Allow to cool for 5 to 10 minutes before serving. Cook the pasta according to directions and drain. While the pasta is cooking, heat the olive oil over medium heat. Crush the garlic clove with the side of a knife, remove the peel, and place in the heating olive oil. This will infuse the oil with garlicky goodness, but be sure to turn the garlic before it gets too dark. Remove the garlic when it is browned on all sides. Add the red pepper flakes to the olive oil and a short time later add the tomato. Allow the tomato to cook for a minute or two and then add the basil. Stir to heat up the basil, then add the cooked pasta. Allow to cook for another minute or two and then remove from the heat and plate it up. Sprinkle a good amount of grated parmagiano-reggiano cheese over the top. Serve and enjoy! There’s something about a nice picture of food that’s really pleasing to my eye. I’m not sure how, but every once in a while I’ve been able to take a nice one food photo myself. 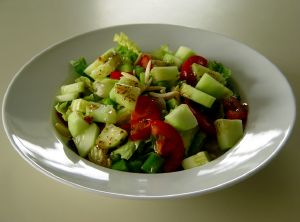 The photo here is of a simple salad, one made with precut bagged lettuce, sliced up cucumber and roma tomato, almond slivers, and some store-bought pesto italian dressing. The white salad bowl adds a bit of simple style to the dish. It was taken with a Sony DSC-F717 digital camera.